Poor weather conditions and high surf are causing delays in the repair assessment for the iconic Ocean Beach Pier. 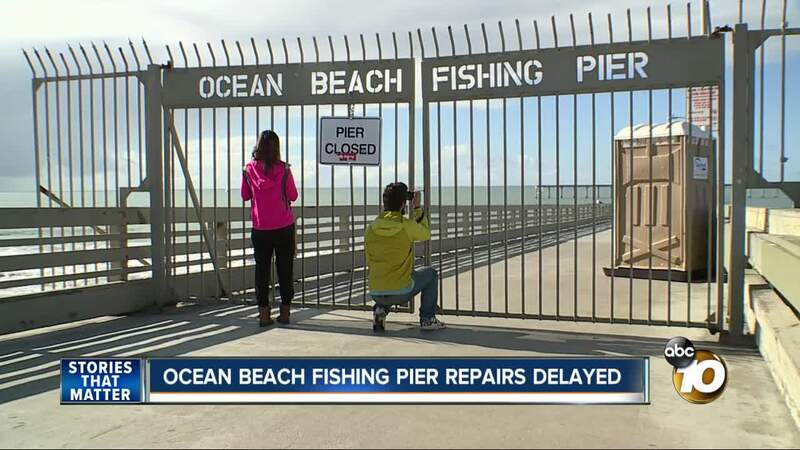 SAN DIEGO (KGTV)— Poor weather conditions and high surf caused delays in the repair assessment for the iconic Ocean Beach Pier. The waves at Ocean Beach were safe for surfing again. But a big part of the beach remained off limits. “It's just sad to see that the pier is closed so I'll have to try again,” said visitor Rose Reyes. On January 18, 2019, giant waves destroyed parts of Pier's infrastructure, forcing the City of San Diego to close down the pier and block access to the cafe. Three weeks later, the City had not been able to finish their repair assessments, due to continued high surf. 10News met Reyes as she was walking toward the pier’s still-locked gate. The 26-year-old said she came to the pier to share a special memory with her date. “We're still kind of dating, and I just wanted to show him a little bit of me,” she said. As a child, the pier was her playground. While her parents worked, the then-toddler spent many sunny days running around the pier with Grandpa Larry. “I just wanted to show him how my grandpa used to always go fishing here when he was babysitting me,” Reyes said. Larry had since passed away. But Reyes remembered playing, sipping on hot chocolate from the WOW cafe, and Grandpa Larry's lucky fishing spot off the pier. The WOW Cafe's current menu advertised for Valentine’s day. However, re-opening the pier and the Cafe by February 14th could be tricky. Reyes still planned to bring her date back here— hopefully, sooner rather than later. “When I hear that this is coming back, I'll definitely come back here as soon as possible,” Reyes said. At the time of publication, the city had no exact date for the re-opening of the pier.